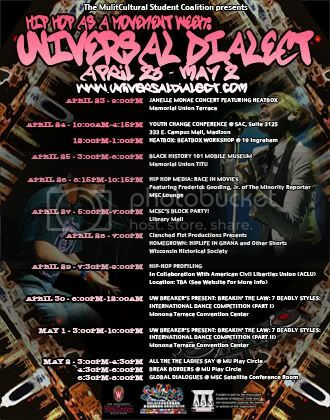 Join us on Thursday, April 29th in standing up against "Hip-Hop Profiling". Sponsored by the American Civil Liberties Union-Student Alliance. Hip-hop experiences an inordinate amount of police scrutiny all throughout the country. Here, in Madison, the same sad story has never been more real. They won't let hip-hop freely walk the streets, they won't let hip-hop freely walk into bars, and they certainly won't let hip-hop perform where they want. If venue owners, bar managers, and local police don't want hip-hop in Madison, its simply too bad for them! We demand equal protection! Come to the terrace and enjoy a free concert performed by Madison's finest up and coming hip-hop acts. Show your support for hip-hop! The event looks to raise awareness on racial profiling issues in Madison and how it affects hip-hop. In addition, there will be selected poetry performances followed by live music with Phonetic One, Stereotype, and more of First Wave's finest emcees. ACLU's special guest lecturer who kicks off the night is Erik Guenther (listed in Marquis Who's Who of American Defense Attorneys from 2007-2010 and as the Wisconsin State Journal's top up-and-coming lawyer in the state). 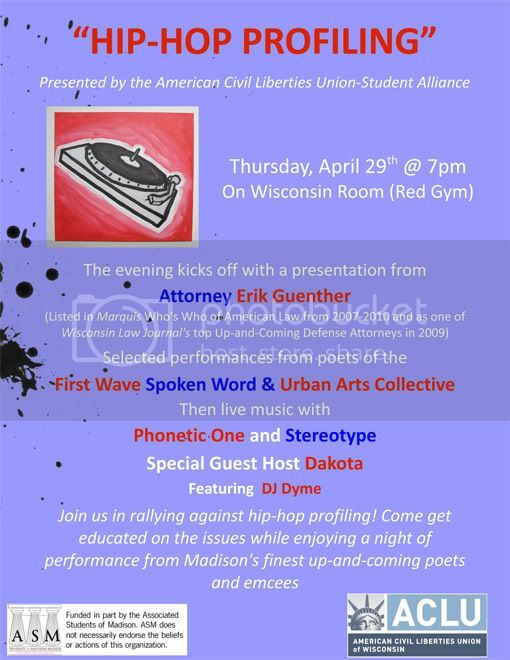 ACLU and MCSC wants to show city of Madison that UW students care about hip-hop's future and more importantly, the issues of racial profiling that are currently seriously affecting our community through new legislation that will be discussed.